The Head of the EU Delegation to Bosnia and Herzegovina and EU Special Representative, Ambassador Lars-Gunnar Wigemark, said that the door to BiH, as a future EU member, is open and that, the way in which the country could reach this door and cross its threshold, is already clearly defined. He stated this in a welcoming address at a New Year’s reception held, on Monday, in Sarajevo, hosted by him along with the EUFOR Commander in BiH, General-Mayor Anton Waldner. Wigemark repeated his earlier attitude, that “the ball is, again, on the Bosnian-Herzegovinian part of the field”, and that everything is now in the hands of the BH authorities. “Anyone who understands football knows that, in order to score, all players need to work together,” he stressed. Recalling last year, he estimated that too much energy was spent on futile political talks. Still, he observed that the effects were not lacking because the set of Excise Law and the Rural Strategy were adopted, which is serious news for agricultural producers in BiH. Wigemark stated that this year would be extremely important for BiH and announced that the European Commission will introduce a new strategy for the successful and rapid integration of the Western Balkan countries, including BiH, in February. This strategy, as he said, will very clearly show what EC expects from these countries on the path of European integration. He announced that a number of important events will take a place this year for countries in the region, such as the EU-Western Balkans Summit, which will be held in May, in Sofia. “We hope that important decisions will be made for all states of the Western Balkans at this Summit, and that the Summit will deliver interesting and positive results,” Wigemark said. The Head of the EU Delegation said that he is a moderate optimist in terms of the expectations for this year, and that he thinks that, regardless of the fact that this is an election year, it is possible to reach certain effects, particularly on the European path of BiH. “Of course, the achievement of the results in the European integration process will require that political parties in BiH leave their different viewpoints aside, at least in key issues concerning European integration,” Wigemark said. He concluded that there was no dispute when the path to the EU was in question and that the common attitude was that the EU is the goal that everyone in BiH is seeking. 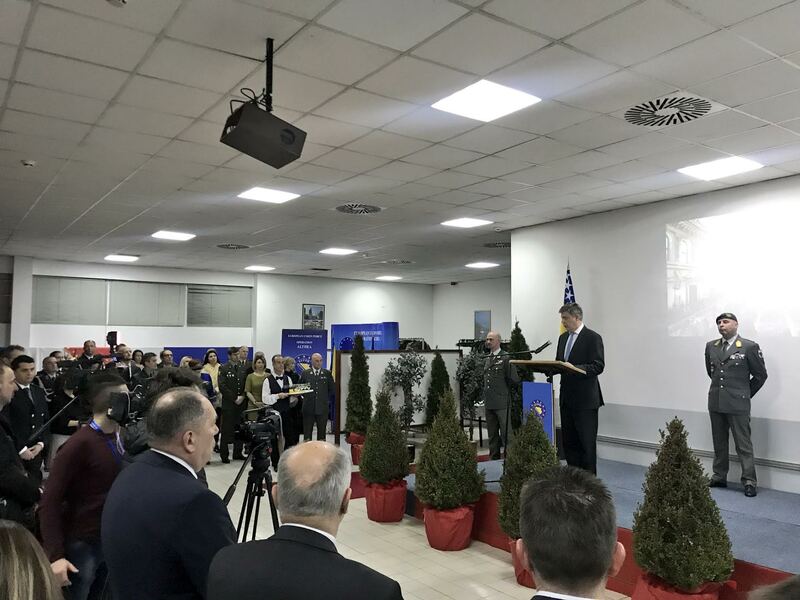 The EUFOR Commander in BiH, General-Mayor Anton Waldner in his address praised the work of the Armed Forces of BiH (OSBiH) and law enforcement agencies, stressing that he highly value their professionalism and responsible approach to the job. He pointed out the excellent co-operation between EUFOR members with OSBiH and members of law enforcement agencies, and that it was confirmed by the first joint exercise “Quick Response 2017”. Waldner said that EUFOR will continue to behave in this manner in the future. As he said, numerous training activities were conducted with members of OSBiH, and announced that this year will be even more.